With increasing cases of new strains of viruses and epidemic diseases, health experts are innovating unique healthcare solutions to improve the combat and cure for diseases. Among these innovations, In-vitro diagnostics plays a considerable role in saving people’s lives by providing accurate diagnosis and prognosis, which further enables improved monitoring and treatment. Owing to the benefits offered by IVD, there is steady growth in its adoption and usage. 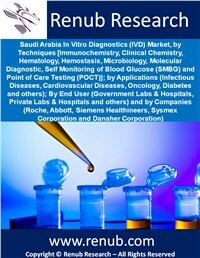 Increasing incidences rates of infectious diseases and the lifestyle diseases are few factors, which are driving the Saudi Arabia In-Vitro Diagnostics (IVD) Market.